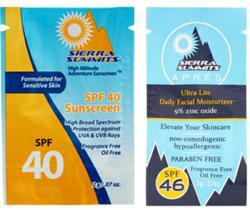 Sierra Summits convenient to carry - easy to use small packets of sunscreen come at the right time. Spring vacations are underway and the individual-use packet makes a perfert travelers choice for tucking into limited luggage space and even tucked into men's swimwear pockets or small carry bags for women. Sierra's sunscreen packets are produced to meet and exceed the new FDA labeling standards in a medical grade FDA regulated facility. Sierra's sunscreens are free of parabens, fragrance, oils, and scary chemicals. Sierra has created Easy to Carry-Easy to Use Packets for two lines of natural personal sun care products: The Adventure sunscreen and the APRES Ultra Lite Daily Facial - both with moisturizers. Jennifer Rice, Master of Physician Assistant Science (MPAS PA-C) is a national board certified practicing physician assistant. PA’s in Dermatology diagnose, treat and prescribe medications for general and cosmetic uses. PA’s perform skin cancer screenings, surgical and cosmetic procedures autonomously under the guidance of a supervising Dermatologist. Sierra Summits Skin Products was born in 2006 while Rice was working in Reno and Lake Tahoe, Nevada. It was patient feedback and concerns about the mainstream sunscreen brands, which prompted Rice to create a high quality, dermatology grade sunscreen to market at an affordable price. The brand “Sierra Summits” was an idea to capture the lifestyle of the Sierras’, an adventure playground for hikers, skiers, cyclists, and travelers.